Selecting the perfect up-do hair stylists for your big day! Let’s face it: your wedding photos will last for lifetimes. You want to look absolutely breathtaking – and if you end up with the wrong hairstyle, your wedding pictures won’t bring as much joy and happiness as they should. That’s why it’s so important to pick an up-do hair stylist who will make you look as gorgeous as you feel. 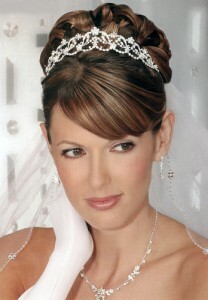 Ask your favorite hair stylist if she or he specializes in wedding up-dos. Many people tend to forget that favorite hair stylists are often experienced in creating gorgeous and stunning wedding up-dos. You don’t have to hire a stranger or go to someone expensive to get the hair you want for your wedding – instead, ask the person who knows your hair the best! If your favorite hair salon stylist can’t give you the hair style of your dreams, not to worry. Ask your female family members and friends who styled their hair to get a good idea of who can do your up-do. Better still, go on Facebook and look at some of your friends’ favorite wedding photos. Does anyone have a hairstyle that absolutely takes your breath away? If so, ask which hair stylist she used. After all, a picture’s worth a thousand words. Finally, don’t be afraid to ask a family member or friend to do your hair for the big day. If you’re going down this road, make sure that they have a few practice rounds on your hair before the big day. You never know how many talented hair stylists you have in your family, so don’t be afraid to put your feelers out there. Make sure you compensate your family member with a special gift or some money for their time and efforts. Use these tips to find a hair stylist who will give you a dream up-do on your wedding day! Also, don’t forget to ‘like’ us on Facebook to get FREE return address printing (quite the hair-raising offer!). Hurry, this deal ends October 31, 2012, so don’t miss out on this amazing offer!